Trade Wars: the impact on agricultural & meat commodities. - How tariff wars and protectionism are unfolding. - The impact on the agricultural and meat industries. - The commodities most affected and the potential impact on prices. - The markets with most exposure and what is behind the US’s declining sensitivity to non-energy commodities. -Why is it important to understand and follow price volatility in packaging in food manufacturing? Brexit and the impact on food commodities. 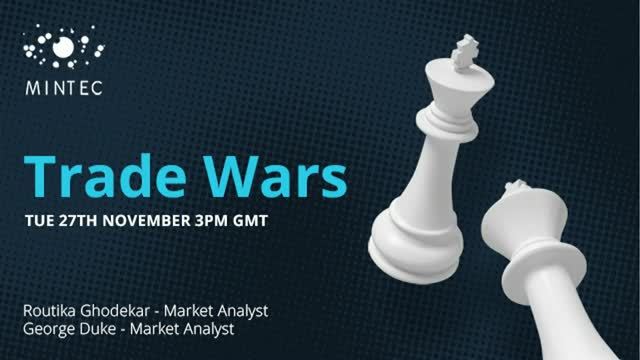 We’ll be examining food trade flows between the EU and UK, as well as taking a closer look at the main trading sectors that could be impacted as part of any deal. We will also be looking into several sector specific case studies, including dairy and discussing some of the potential risks. By submitting your details, you confirm that you agree to the storing & processing of your personal data by Mintec as described in their privacy statement. https://www.mintecglobal.com/hubfs/Documents/Mintec-Documents/Privacy-Policy.pdf? Mintec, the world’s leading provider of global pricing data and intelligence for soft commodities and food ingredients. The new Mintec Analytics platform provides commodity price data on over 11,500 price series and history, along with customisable dashboards, cost models and market insight. Title: Trade Wars: the impact on agricultural & meat commodities.